Home » india news » Activists present anti-lynching draft law MASUKA, but will the Centre and states act? Activists present anti-lynching draft law MASUKA, but will the Centre and states act? Rising incidents of mob lynching incidents across India has forced the civil society to stand up and demand some stringent action against those responsible for such heinous acts. The killing of 15-year-old Junaid Khan by a mob in a moving train led to the ‘Not In My Name’ campaign wherein people from all walks of life came out on streets to protest across the country. Amid these circumstances, another group of activists are demanding a strict legislation to deal with such crimes wherein most of perpetrators get away in absence of stringent laws. 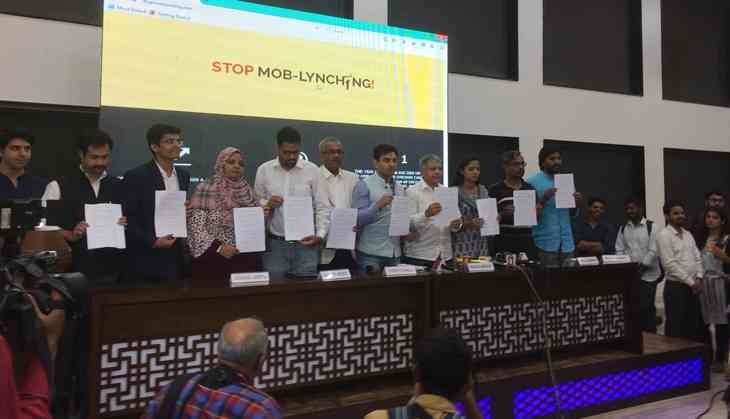 On 7 July, these activists, who a month back launched the National Campaign Against Mob Lynching (NCAML), released the draft law of Manav Suraksha Kanoon (MASUKA). The draft law was released by Prakash Ambedkar, the grandson of BR Ambedkar, along with Shehla Rashid and Tehseen Poonawalla – core members of NCAML. Eminent lawyer Sanjay Hegde and Shehzad Poonawalla were also present during the release. “An ancient civilisation like India has to demand a law against lynchings and vigilantism shows how we are deteriorating as peoples. I firmly believe the government will pass MASUKA and make this law a reality. We have got tremendous support from all sections of society and from veterans to us youngsters from marching to the Parliament to taking it up with chief ministers and MPs and following up with the government. We will do everything in order to make MASUKA a reality,” said Tehseen, who is also the founder of MASUKA. In addition to this, Prakash Ambedkar pointed how there is no provision of lynching in the SC and the ST (Prevention Of Atrocities) Act. Therefore, there is the need for an act that provides for effective protection of the Constitutional rights of vulnerable persons, to punish acts of lynching, to provide for special courts for the expeditious trial of such offences, for rehabilitation of victims of lynching and their families and for matters connected therewith or incidental thereto. “Manusmriti is being revived through propaganda and therefore it is crucial to have such a law. If the central government gives its nod to this law then it can send a message that instead of supporting such acts, it is against it,” he said. Meanwhile, since law and order is a state subject, even if the central government passes such a law an enabling law has to be passed by the state governments. It is for this reason that the core members of MASUKA are reaching out to different state governments to get their approval. Sources have informed Catch that Delhi government has already given its nod for introducing MASUKA and it is likely that it will be presented in the assembly in the next session. Though Aam Aadmi Party (AAP) is keen on enacting the law but fear that the Lieutenant Governor could block it. In these circumstances, AAP’s introduction of the law could just be a symbolic move. Similarly, attempts are being made to reach out to Left Front government in Kerala and Rashid has taken the responsibility of getting in touch with Chief Minister Pinarayi Vijayan. Some committee members are of the opinion that the Congress government in Karnataka too will be approached. However, other members differ and say it will lead to the enactment of law becoming a BJP vs Congress issue, which according to them should be totally avoided. One core committee member said that efforts are being made to reach out to several BJP governments also and that the response has been “very positive”. Meanwhile, the draft law has been made available for the public for their inputs and suggestions. Similar programmes are also being planned in other states including Gujarat, UP, Maharashtra and some southern states. Members of the core committee had plans to meet Prime Minister Narendra Modi and submit a copy of the draft. However, since Modi is out on a foreign visit, a copy is likely to be sent to his office. Meanwhile, the salient features of MASUKA include the definitions of mob, lynching, victim and offensive material; that lynching be made a non-bailable offence; immediate suspension of the SHO of the concerned area; life imprisonment for those convicted of death; punishment for obstructing legal process; Application of Code of Criminal Procedure, 1973; time bound judicial inquiry; compensation and rehabilitation of the families of the victims; among others. The drafting members of the law included Hegde, JNU proferssor Nivedita Menon, Delhi University professor Apoorvanand, Amnesty International campaigner Sanam Wazir, journalist Anil Chamadia, among other activists. Govt welcomes new recommendations for Muslims' education. But will it implement? READ NEXT >> Govt welcomes new recommendations for Muslims' education. But will it implement?